Creating your DeployBot account was the first step. Now what’s next? Repositories! 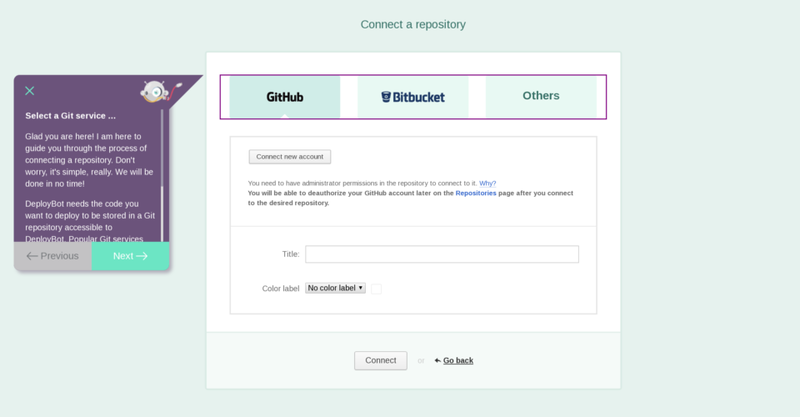 Connecting a repository can be a little tricky at first, especially if working with a continuous deployment tool is new for you. But don’t worry! For each of the necessary steps, your new robot assistant gives you the context you need to understand exactly what is happening. And to make things super easy you’ll be guided through this process interactively. 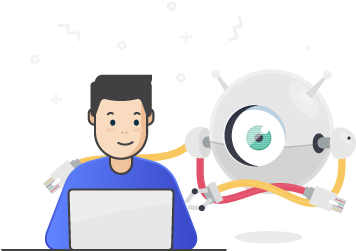 He’ll make sure you know which hosting service to choose and which account to connect, how to select a repository, name it and add a color label so you can identify it at a glance. No guessing and no FAQ sheets needed. This is just a start – more help is on the way! Were already working on extending this feature. Soon your helpful new friend will be wherever you need him. And once you’re sure you know what to do, with one click he’ll hide until you have another question.